Jacek Rostocki, Deputy Prime Minister and Finance Minister of Poland. Faced with a 23.6 billion PLN ‘hole’ in this year’s budget, yesterday’s meeting of the Council of Ministers approved savings of 7.6 billion PLN proposed by Deputy Prime Minister and Finance Minister of Poland, Jacek Rostocki. The largest cut, 3.14 billion falls on the Ministry of Defence, while the Ministry of Transport, Construction and Maritime Affairs faces a cut of 1.01 billion PLN. The savings will be ‘shared’ by Directorate of Motorways and Trunk roads which loses 2 million PLN and polish railways which lose 1 billion PLN. 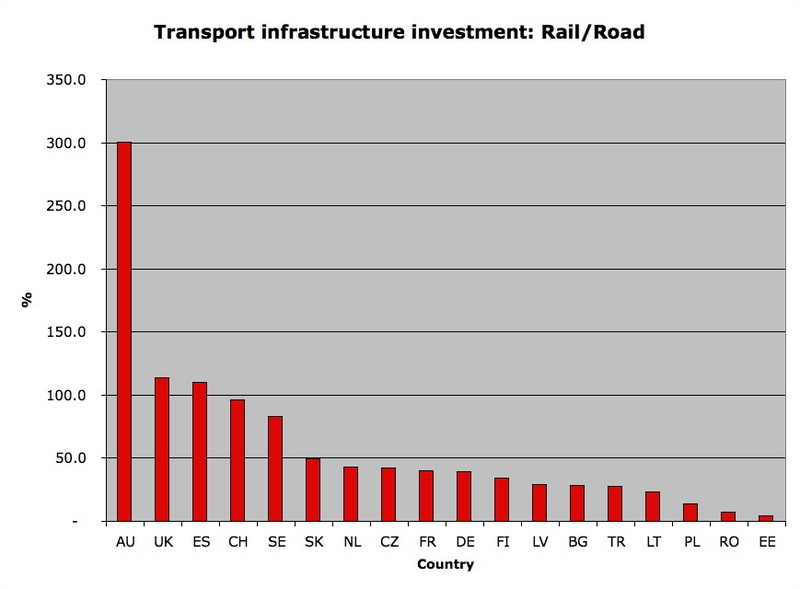 Sadly rail, lacking a convincing lobby to defend its interests, is perceived as a ‘soft target’ by the Polish government and is regularly singled out for swingeing cuts which leave road investment effectively unscathed. 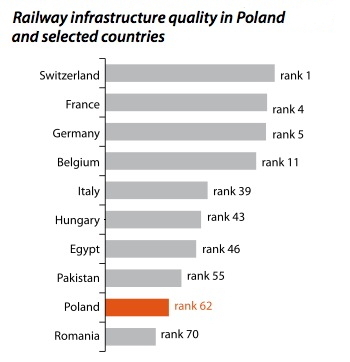 While government sources emphasise that the cuts will not effect investment in rail infrastructure upgrades, it seems highly unlikely that Polish railways will be able to take up all the EU infrastructure funds that would have been available had Poland’s rail infrastructure manager, PKP PLK, been more generously funded. 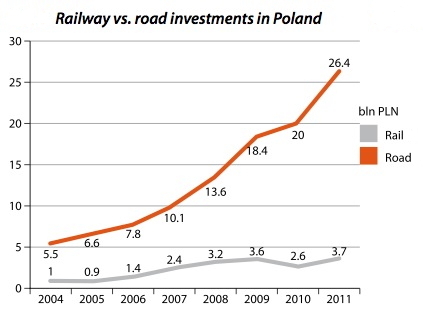 During the period 2007-2013 Polish railways were allocated a pool some 20 billion PLN from EU funds. Unfortunately due to problems in finding “own funds” it appears likely that over 5 billion PLN will be lost. As for the next funding round, sources close to the European Commission have reported that while Poland has been lobbying hard for funding for light rail and tram projects the same has not been happening for prospective heavy rail investments. 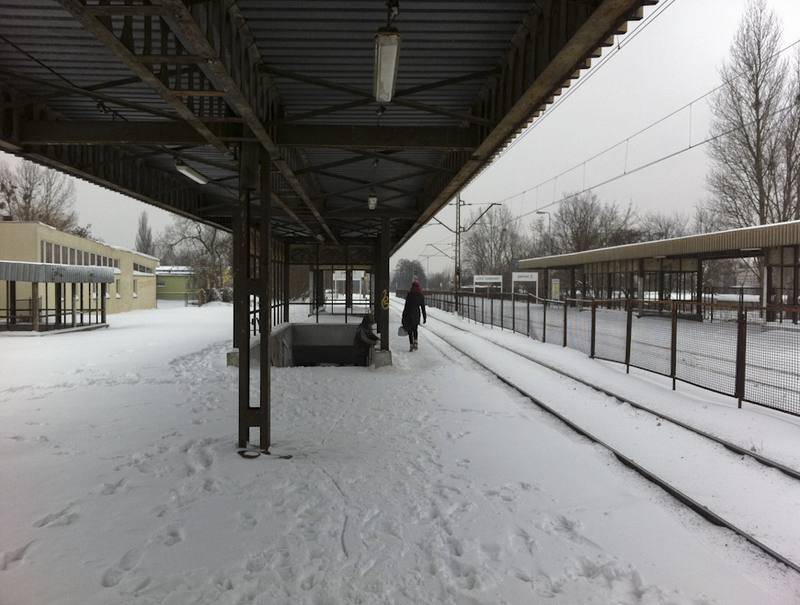 Only the Bulgarians, Romanians and Italians are more dissatisfied with their rail services. Table courtesy European Commission. The European Commission has published the results of a public opinion survey which shows, that of the 25 EU nations surveyed, Poland is in 4th place when it comes to dissatisfaction with the country’s rail network. 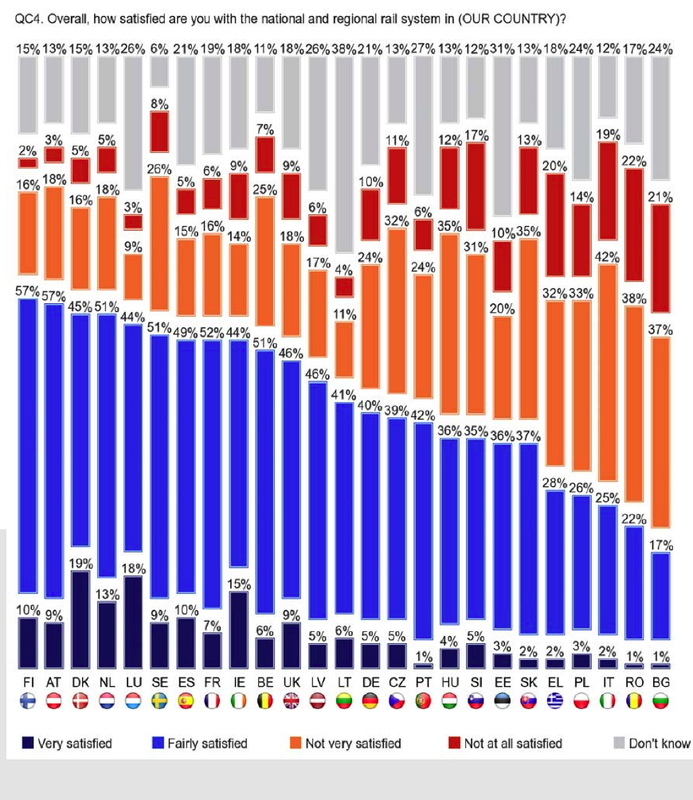 Only 28% of the Poles surveyed said that they were satisfied with the nation’s railways. Jacek Rostocki, Poland’s Finance Minister at the World Economic Forum in Davos in 2009. Mr Rostocki shares Mrs Thatcher’s antipathy to rail, but seems to have been persuaded that Poland would not get its share of the next tranche of EU funding if it did not continue to invest in improvements to its rail network. Photo by World Economic Forum. It has been a crazy fortnight. After having spent some 10 years hiding in a quiet backwater of Poland, my alter ego has suddenly been rediscovered. The consequence are a drastic change of lifestyle. Instead of resting, generally avoiding work and only doing the odd bit of translation when the pile of bills gets too high, I’m suddenly in demand. An urgent summons to attend the Economic Forum in the mountains near Poland’s border down South is followed by an important business meeting the next day up North on the coast. Rushing up and down the country by train is very pleasant, and results in many adventures which really deserve to be written up on BTWT, but the need to read briefing notes, plan my meetings and generally be prepared, takes away a great deal of time which was previously spent updating the blog. So I would like to apologise to all BTWT’s readers and friends – a big personal “Sorry!” for the break in service that has occurred. And it is not just my personal life that has been in turmoil: hardly had the e-ink dried from our last post announcing a draconian cut in the infrastructure grant for PKP PLK, when there was a massive reversal of government policy and Andrzej Massel, the Secretary of State for railways, announced that, instead of there being less funds for rail in 2013, there would actually be more! We are still reading the tea leaves on this about turn, but it does seem that someone very senior in government realised that the next tranche of the EU funds for infrastructure are to have a stronger pro-sustainable transport bias than hitherto, and that if the Polish government wanted its fair share of the EU cake, it would not get away with diverting nearly all its EU infrastructure funding support to building new roads as it had done hitherto. As if this wasn’t wasn’t enough, for the first time in over 40 years the number of passengers carried by Poland’s railways has actually increased. 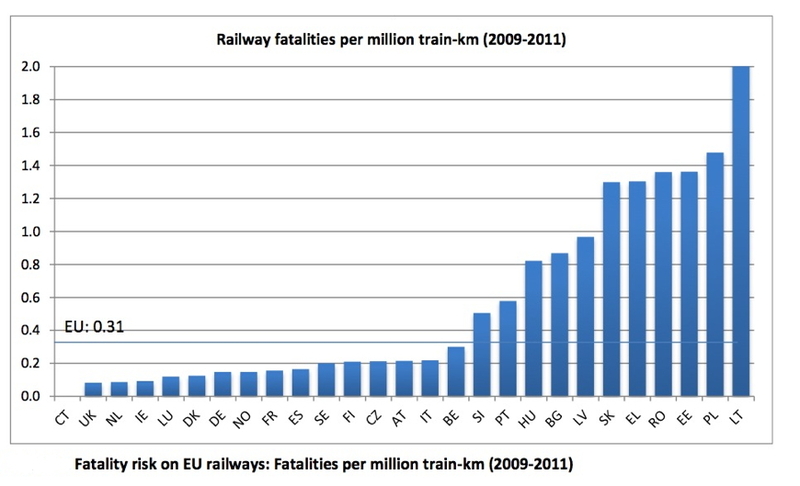 Of course some of this increase is due to Euro 2012, but a careful reading of the statistics indicates that the increase in passenger carryings has been sustained, even after the championships were finished. All in all, 2013 heralds to be an exciting year. BTWT intends to be there and we look forward to having you along for the ride. Lift door at Krakow Glowny station on 4.9.2012. In spite of a rebuilding programme which started nearly 40 yeas ago, and received a recent 130 million PLN (approx. 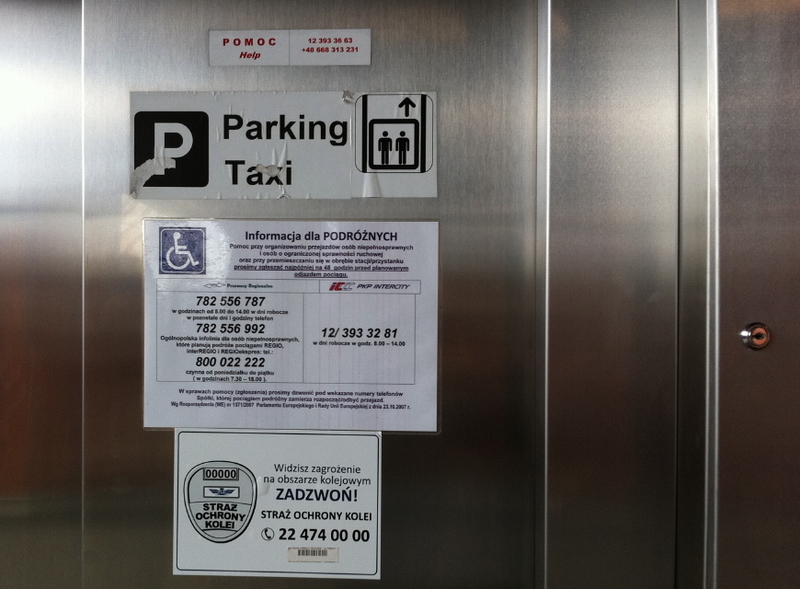 26 million GBP) EU-assisted boost, the lifts only go up to the car park and not down to the passenger concourse and the new tram station. There are no escalators. 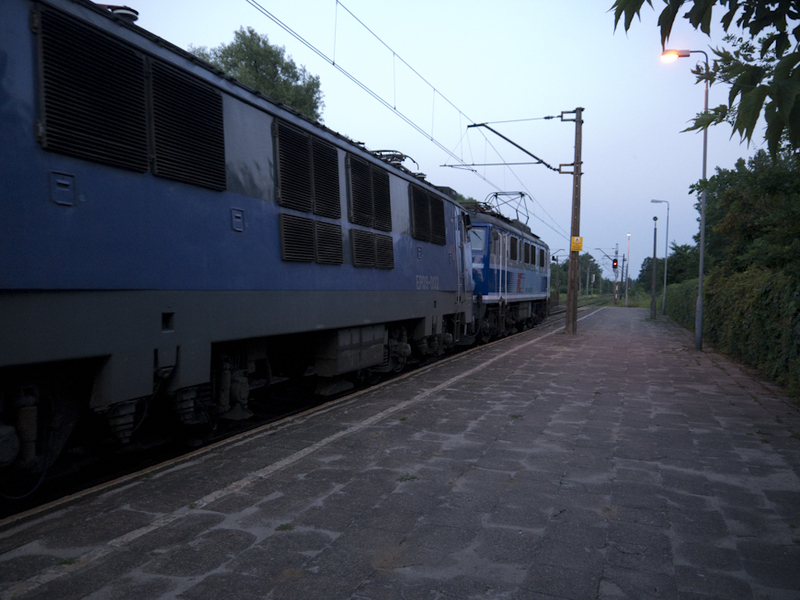 On Monday 1 September the news was released through the usual unattributed channels that the Ministry of Finance was planning to cut support for Poland’s railway infrastructure by 500 million zloty (approx. 125 million Euro). This year the support received by PKP PLK (Poland’s railway infrastructure administrator) was 1.3 billion złoty so the cut – when adjusted for inflation – represents a claw back by the Ministry of nearly 50%. BTWT’s own unattributable channels report that the bosses of Poland’s largest railway operators (outside the PKP Group) are furious. They believe that the cutbacks will be reflected in hikes in track access charges which are already the highest in Europe. 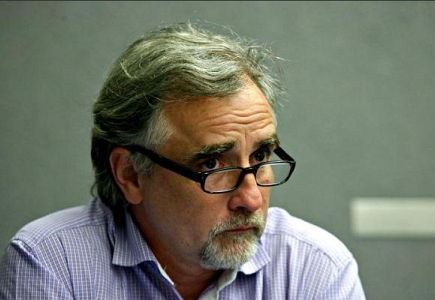 BTWT sources indicate that the Finance Ministry’s Plan ‘B’ – if the plans generate sufficient opposition – will be, after some time, to announce that after ‘consultation’ the cut will only be some 300 million PLN, that being its minimum internal target cut all along. 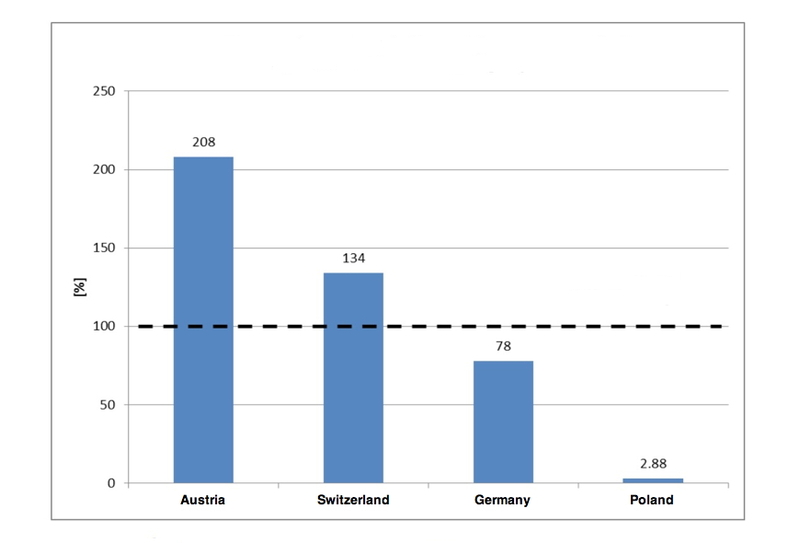 Mitigated or not, there can be no doubt that the cuts will damage Poland’s economic growth and generate extra car journeys that will jam up and pollute Poland’s car-priority cities. One can only hope that the cuts will end the ‘white gloves’ treatment that PKP PLK receives from the Ministry and that there will be a concentrated economy drive within the company to reduce waste. At the moment infrastructure work commissioned by PKP PLK cuts upto 100% more than the EU average. It is also high time that transport minister, Slawomir Nowak, cut back on political vanity projects like the infamous underground station in Lodz and reinvested the money saved on desperately needed infrastructure repairs. Maria Wasiak stays in post. Maria Wasiak. Photo PKP SA. At an extraordinary general meeting of PKP SA shareholders held earlier today Maria Wasiak was appointed chairman of PKP SA. Ms Wasiak has been working as ‘acting chairman’ of PKP SA since 30 December 2010, following the dismissal of the previous incumbent, Andrzej Wach by the new Deputy Minister responsible for Poland’s railways, Andrzej Massel. Ms Wasiak will share the duties for which she has been responsible up to now with Romuald Bosakowski, who was appointed a board member today. Ms Wasiak hails from Radom and studied law at Warsaw University and management at the School of Economics in Poznan. She was involved in local politics and became the Deputy Chief Executive of the Radom District Council in 1998 from where she moved to the political office of Tadeusz Syryjczyk, the Minister of Transport. She is seen as politically connected to Civic Platform, Poland’s governing party. She joined PKP in 2000 in the role of ‘Project Director’. In 2001, she was promoted to the position of chairman of the PKP subsidiary responsible for regional services, PKP Przewozy Regionalne. In 2002, she became Head of PKP’s privatisation office. She was promoted to main board member with responsibility for ‘Promotion and Social Affairs’. While some commentators regard the non-appointment of a suitably qualified ‘Rail Czar’ as a failure, it is unlikely that the Government, working through the Ministry of Infrastructure, looked very hard for an alternative. Maria Wasiak is seen as a safe pair of hands who will regard the privatisation of PKP SA’s assets as her top priority. Her appointment and the ‘steady as she goes’ message that it conveys will have pleased the Ministry of Finance and received its tacit backing – the State Treasury controls the voting rights at PKP SA’s general meetings. A powerful external candidate may have upset the tacit understanding between the government, rail union bosses and top rail managers whereby everyone milks Poland’s railways for what they can and the network gradually decays until only a small core is left. Less pleased will be PKP’s customers. Without fundamental changes to the way the railways are managed passengers will be left with even fewer overcrowded trains and with increasingly inaccurate and inadequate information. Freight operators will face rising rail access charges and deteriorating tracks. While wishing Ms Wasiak well with her appointment, we suspect that we will be continuing to be chronicling the decline of Poland’s railways for many more years to come. Englehardt and Wach to go? A happier winter – Febuary 2009. YouTube Video by Dominikq2. There are very strong indications this evening that Undersecretary of State, Juliusz Engelhardt, will be paying the price for the disastrous implementation of the 2011 timetable. Engelhardt, who is responsible for Poland’s railways at the Ministry of Infrastructure, had already lost the support of his colleagues in the Sejm as a result of PKP’s failure to complete certain rail infrastructure improvement projects for which EU funding had already been secured. The final nail in the coffin is this year’s timetable fiasco. News from a number of sources would suggest that his dismal will be accompanied by the resignation of PKP Group Chairman, Andrzej Wach. So far, Engelhardt’s boss, the Minister of Infrastructure Cezary Grabarczyk – a firm ally of Prime Minister, Donald Tusk – appears to be safe. But, for how much longer? It is Grabarczyk who is pushing through investment plans fora new underground station and for a multi-billion zloty tunnel under his home city of Lodz . 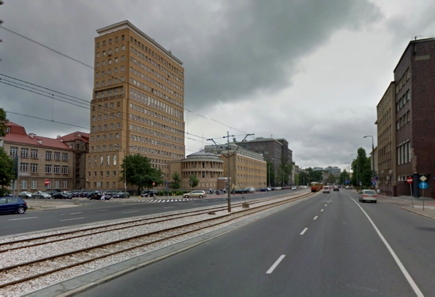 He has also asked his team at the Ministry of Infrastructure to urgently prepare plans for a new branch line to link up with Lodz’s airport at Okecie. Meanwhile the rest of the PKP network is crumbling. Grabarczyk’s grandiose plans, have attracted little criticism, however the minister’s latest investment might just prove his undoing. 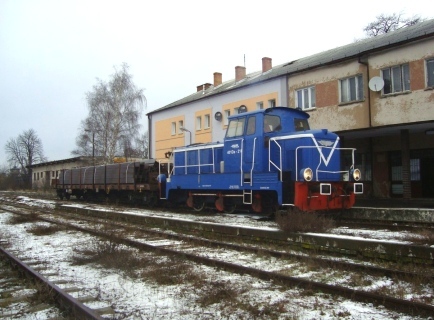 While passengers shiver on station platforms for trains that never come, Grabarczyk has just bought himself his department three luxury limousines for 300,000PLN. It is just such petty acts of vanity that can break a seemingly charmed career.